An elegant basket arrangement in white seasonal flowers. Please note that all flowers are subject to availability and substitutions may be made at the florist's discretion. A pretty bouquet in pink, white and mauve shades (vase not included). Please note that all flowers are subject to availability and substitutions may be made at the florist's discretion. 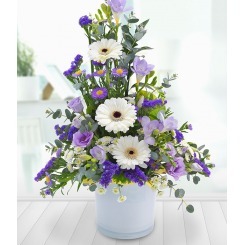 A container arrangement in purple, lilac and white shades. Please note that all flowers are subject to availability and substitutions may be made at the florist's discretion. 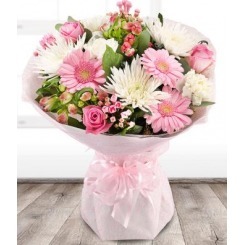 A delicate aquapack handtied of delightful pink and white flowers. Please note that all flowers are subject to availability and substitutions may be made at the florist's discretion. A bright and cheerful bouquet in orange and lime shades (vase not included). Please note that all flowers are subject to availability and substitutions may be made at the florist's discretion. A pretty bouquet in peach and bronze shades (vase not included). Please note that all flowers are subject to availability and substitutions may be made at the florist's discretion. A fiery bouquet in orange and deep red shades (vase not included). Please note that all flowers are subject to availability and substitutions may be made at the florist's discretion. 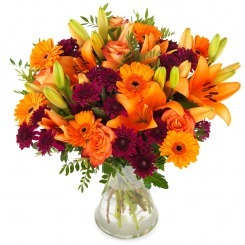 A bright and cheerful arrangement in orange and lime shades. Please note that all flowers are subject to availability and substitutions may be made at the florist's discretion. 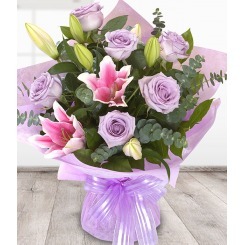 A stunning handtied bouquet in lavender and pink shades. Please note that all flowers are subject to availability and substitutions may be made at the florist's discretion. 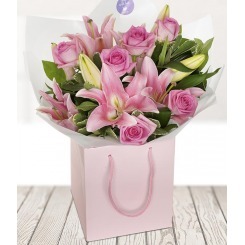 A stunning handtied bouquet of pink roses and lilies.